Pitcher Tom Seaver, 60, who led the underdog New York Mets to their miraculous World Series championship in 1969, caught the winemaking bug after his induction into the National Baseball Hall of Fame in 1992. A California native, he and his wife, Nancy, eventually settled on a 115-acre property on Diamond Mountain, where some of Napa Valley's best Cabernet grows. Meanwhile, he has introduced some of baseball's great players to the world of wine. Wine Spectator: When did you become interested in wine? 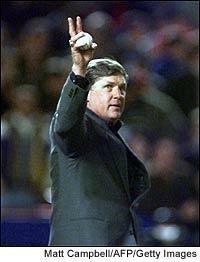 Tom Seaver: I started drinking wine in college, Almaden or something like that. I love Zinfandel, Petite Sirah, Cabernet, Bordeaux, Rhône. Wine is a food, and I don't like eating the same thing every night. I'll go to a wine shop and get 12 different bottles that I haven't tried before. WS: Why did you decide to make your own wine? TS: I've always wanted to raise grapes. My father was in the raisin business, so I guess the apple doesn't fall far from the tree. I wanted to plant the vineyard in front of our house so I could see it from my office, but Nancy said, "No, you've got 115 acres of land, you go find your own piece." I took a compass with me and found an area with a south- and southeast-facing slope. I brought [vineyard manager] Jim Barbour up there, and he said, "How in the world did you find this? This land is what people are killing for out here!" It was really a stroke of luck. WS: Are you heavily involved in the grapegrowing process? TS: I do a lot of the grunt work myself, which I thoroughly enjoy. Because of Jim, this has been a huge education for me. I bug him like crazy with questions. I tell him to give me any job; I don't care how menial it is. At one point the first year, he said, "Will you just leave the damn plants alone and let them grow?" Viticulture is very much like a baseball season. It's a steady process; you have to do your homework and get the work done on time, like you do between starts when you're a pitcher. You hand them the ball and tell them to go out and win. I have 3,970 plants on 3 acres. My wife thinks I've gone too far because I've named every one of them. WS: You're sticking with three acres for now? TS: That's it. That's it. [pause] Well, I have another area I could plant, but it's down in front of my office, and my wife…. WS: When will you release your wine? TS: We just finished our third year and got 3.2 tons of Cabernet grapes. We're not sure what we're going to do with the juice yet; it's sitting in oak. We may bottle some this year. Next year for sure. It will be about 400 cases, and we'll sell it through a mailing list. WS: Any favorite wine-drinking experiences? TS: After the induction in Cooperstown, there's a dinner for only Hall of Famers. Sitting at my table one year--imagine this--were Bob Gibson, Don Sutton, Sandy Koufax, Steve Carlton and Rollie Fingers. Everybody there enjoyed wine, so I said, "OK boys, let's start having great wines at this dinner. Next year, bring a good bottle." It's expanded like crazy. The year Ozzie Smith was inducted, he came over to our table and said, "Tom, how do I, you know, get a seat at the wine table?" And I said, "It's a very long process, Ozzie, it's very secretive and there's a whole initiation thing." And he said, "Yeah, but what do I have to do?" And I said, "Well, bring a bottle of wine." [laughs] We must have 20 guys now bringing great wine. WS: Are you going to bring your own wine someday? TS: Absolutely. I'd be proud as punch to do that.